An Egyptian court has acquitted Hosni Mubarak of killing protesters during the January 25 revolution in 2011, adding that he should not have faced charges in the first place. 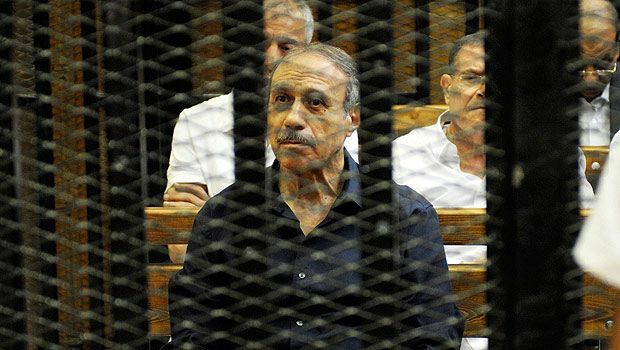 The Court also cleared former Minister of Interior Habib El-Adly and his six aides of all charges. Meanwhile, Hosni Mubarak and his sons Gamal and Alaa Mubarak and businessman Hussein Salem were also cleared of all charges in relation to embezzlement and corrupt gas deals. The Presiding judge urged the media and onlookers to consider the verdict, of which a 280 page summary will be uploaded online, before expressing either support or offence to the verdict. According to legal sources, the verdict can be appealed by the Prosecution. In the last court session, the Court showed a video of the case’s evidence, which compromise 160,000 pages. The video was produced by private satellite channel Sada El-Balad, which has exclusive rights to broadcast the trial. Mubarak, who ruled Egypt for thirty years, had been accused alongside Egypt’s former Minister of Interior Habib El-Adly and six others of involvement in the killing of protesters during the January 25 revolution that saw him resigning after 18 days of protests. The Court of Cassation had overturned his initial life sentence over technical faults in the initial trial. The former President had declared in the previous court session that had never ordered the killing of protesters who participated in the 2011 uprising. “Mubarak, who stands in front of you, would never order the killing of protesters … or any Egyptian under any conditions,” he had said in August. The former president had also denied he was behind the security vacuum during the 18 days of protests.